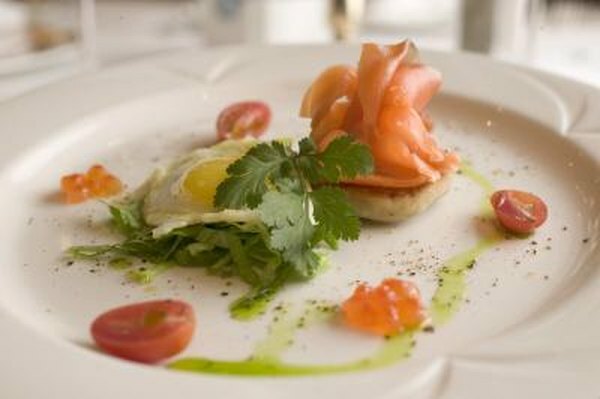 Smoked salmon, considered a delicacy by some, is eaten by many people for breakfast --usually on a bagel -- or served with sour cream and caviar at dinner parties. There are some risks associated with eating smoked salmon more than occasionally, however. Smoked salmon may contain environmental pollutants that make it unsafe. Salmon farmed in a commercial fishery may be tainted with polychlorinated biphenyls, also called PCBs, or dichlorodiphenyltrichloroethane, a substance known as DDT. These chemicals are often found in water, soil and animal flesh due to their slow rate of decomposition. The U.S. banned the use of PCBs and DDT in the 1970s. Eating smoked salmon and other foods that contain these compounds may cause cancer as well as damage your immune system, according to Julie Rehmeyer, author of an article published in "Science News" in 2007. Cold smoked salmon may carry the Listeria monocytogenes bacteria, due to the way in which it was processed. A healthy person can generally consume this food without contracting listeriosis, a rare infection caused by the bacteria found in smoked salmon. However, the U.S. Centers for Disease Control and Prevention recommends avoiding smoked salmon if you are pregnant, elderly or suffering from a compromised immune system. Similarly, do not feed smoked salmon to newborns. Symptoms of listeriosis include diarrhea, convulsions, fever and muscles aches. It also may trigger miscarriage in pregnant women. There are 666 mg of sodium in a 3-ounce. portion of smoked salmon. That is nearly half the American Heart Association's daily recommended intake of 1,500 mg of sodium. Regularly eating more than the suggested level of sodium may cause hypertension. Research data in the December 2004 issue of "Nature Clinical Practice Cardiovascular Medicine" indicate that the sodium in smoked salmon and other high-sodium foods does more than increase blood pressure in vessels; it can permanently damage your aorta. Smoked salmon is a good source of selenium. It has 27.5 micrograms of selenium per 3-ounce serving. Men and women over age 19 should consume 55 micrograms of selenium each day. However, if you regularly include this food in your meal plan along with other foods rich in selenium, such as wheat germ, liver, butter and garlic, you may exceed the suggested daily upper intake limit of 400 micrograms . Too much selenium may causes rashes and lethargy; it may also cause your fingernails to detach from your nail bed.